This Sunday’s heavyweight clash between Richmond and their old enemy, Collingwood, continues a long and fierce rivalry between these two inner-suburban, working-class football clubs that began in the 1920s. It is the stuff from which legends are made. For our family, this game has a deeper and much sadder meaning. It is the first game between these clubs since Roy Willard, my children’s grandfather, passed away. Spending his formative years in Thornbury, Roy became a Collingwood man, a Magpie. He also survived three and a half years in a prisoner-of-war camp during World War II. Born in Cambridge, England, Roy migrated to Australia seven years later with his mother. He passed away on 13th August, 2017, just a few days shy of his 98th birthday, having lived a very long and productive life. 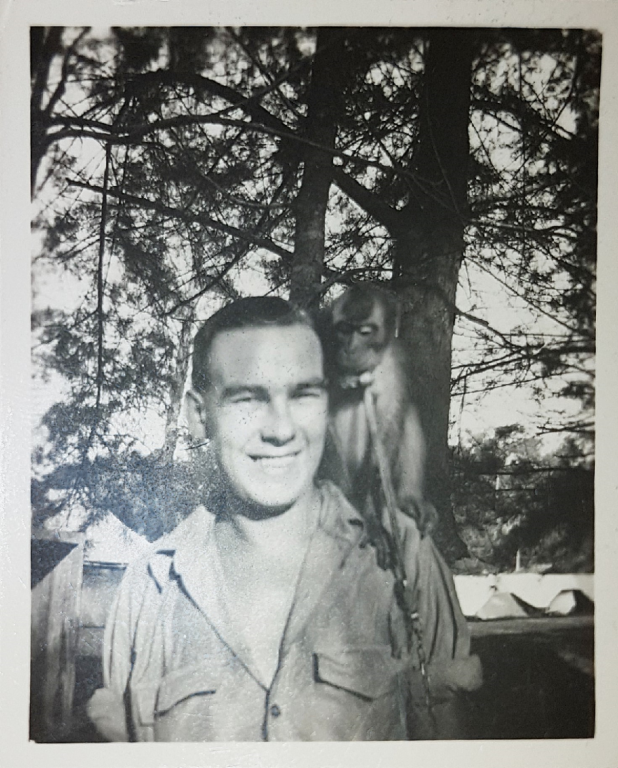 During World War II, the budding Civil Engineer joined the Australian Army as a Sapper and was dispatched to Singapore. His mission was a simple one, he was sent to blow up bridges. Roy’s “official” duties ended prematurely when Singapore fell soon after his arrival. Along with many other young Australian soldiers, he was surrendered to the Japanese and detained at Changi, interned during a time when Allied prisoners of war were treated with appalling cruelty. He battled starvation, disease (such as malaria and dysentery), exhaustion and brutality. Daily activities, when he was strong enough to perform them, were thinly disguised slave labour. Strangers stole his freedom in the most merciless manner imaginable. Coincidentally, another young Australian with a similar name, R.J. Willard, was also a prisoner of war. Tragically for his family, he did not survive. However, as the result of an army mix-up, Roy’s mother received a telegram advising her of her son’s death. This was of course a great sadness. Three years later, she received another telegram advising her of his imminent return. Visit the prisoner of war memorial in Ballarat and you will read their names engraved beside each other. Eventually, he was freed and returned to Australia to recuperate. Roy’s brother-in-law recently recalled standing in a guard of honour on the streets of Melbourne as the emaciated servicemen were driven from Station Pier to the Repatriation Hospital in Heidelberg, where Roy was to be nursed slowly back to health. Melburnians lined every street along the route in a sombre show of respect. Roy spoke sparingly of this dreadful ordeal, telling his family only that he was instructed to “get on with it” by a Military Doctor during his recuperation. He took this advice seriously, returning to work as soon as he could, building his life with his childhood sweetheart, Eleanor. They had three daughters and five grand-children. Roy’s story is not one of gung-ho soldierly achievements, of adventure and derring-do. Nor is it the story of a young man taken too soon from this world. Rather, his is the story of a sensitive, gentle and thoughtful man who was subjected to unspeakable hardships during his early adulthood. Caught up in events that he could neither control nor influence, his struggle became one of daily privation, grateful when the sun rose each morning, regardless of the indignities that each new day would surely visit upon him and his mates. Those of us who have led privileged lives can never fully comprehend the profundity of this sacrifice. Roy did not allow these terrible war-time experiences to overwhelm him. Instead, he regained his health steadily and resumed his place in the world that he had helped to protect. He lived an ordinary life, did ordinary things. He completed his Engineering studies, worked for the same company for 47 years, put food on the table for his young family and enjoyed pottering away in his garden on weekends. He loved Christmas and meeting up with his cobbers on ANZAC Day, an annual opportunity to share tiny flakes of his life with men with whom he had shared everything during that horrendous and tumultuous time. At his 95th birthday lunch, he enjoyed a steak, eating it with gusto. Roy was grateful for the gift of each day. Later in life, he loved nothing better than to sit with his grandchildren and share the stories of their lives as they grew into adulthood, always asking questions and showing interest in them. Not long before his death, he told one of his daughters that he considered himself to be a lucky and contented man. Like a high-flying dove, his spirit soared above the adversity of his youth. Most poignantly, he forgave his tormentors. Doubtlessly, he outlived most of them. While he had a passing interest in Australian Football, he was always a true Magpie. Having grown up in neighbouring suburbs to the north of Collingwood, he retained this tribal allegiance for the rest of his life. We have priceless memories of attending matches between our teams with Roy during the 1990s. As he lived in Mt Waverley and we lived in Northcote, some logistical effort was always required to transport our clan to the game. 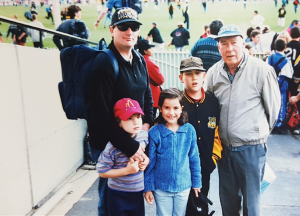 We spent many afternoons together at the MCG or at the old VFL Park in Mulgrave, sharing homemade sandwiches and a bucket of hot chips, recording the scores in the Footy Record,waving flags and barracking for the Tigers and the Pies. We Richmond fans usually went home with our tails between our legs, delighting Magpie Roy. Eventually, as he grew older, he stopped attending the football with us, at first unable to cope with night games and, eventually, with any games. The passage of time is harsh and unkind. Not to be denied, he was always ready with a quiet barb whenever the Maggies won and the Tiges didn’t, opportunities that were presented to him far too often for my liking. Last August, as he was slipping away, Richmond were beaten in Geelong. What I would have given for another friendly niggle at my expense! Sadly, it never came. RIP, Roy. Son. Husband. Father. Grandfather. Soldier. Engineer. Gardener. Magpie. Inspiration. An era has ended. First published on MCC’s Balcony Banter website. Beautifully told story and tribute Joe. Easy to overlook that the survivors were often as mortally wounded as the fallen. My maternal grandfather’s story on the Western Front in WW1 has similarities. His promising early life cleaved into a long twilight of disappointments but persistence. Thanks Peter. Appreciate your comments. A wonderful tribute, lovingly re-counted. 98 is a great innings – RIP Roy. “Those of us who have led privileged lives can never fully comprehend the profundity of this sacrifice.” This line is oh so true. I felt this was a story that should be told.